Memories Of High School: I AM NOT A BAD BOY!!! Last week, I started the concluding part of Memories of High School when I talked about the Class’ Biggest Dullard. (If you missed it, click ) well, today, I will talk about something else. 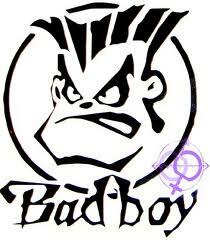 The topic of today is I AM NOT A BAD BOY!! Of course, I am not and the secretly obvious truth is I was never and will never be one. Most of the time when ‘those people’ called me out on the assembly, punished me and did all manner of stuff to me, I never intentionally entered any trouble throughout my stay in school. Every wahala I entered was a mistake but what do you expect, bad guy things now.. If anybody asked me, I will end up saying “well, it’s nothing joo, it’s just one of those things” … huh!!? Heaven knows that deep down in my heart, I didn’t mean a single word and I always prayed for a cup Passover. Let me tell you about a few troubles I got into that gave me that look. I was between 9 and 12 years old when I entered jss1. I was very innocent I must say. The funny thing was that I started getting into trouble since jss1. On that good day, my class teacher who I thought was my best teacher (she was practically every jss1 student’s best teacher then) came into the class. She came to teach English Language which was her subject and of course, my best subject. Unfortunately for her, he had a sore throat and a cracked voice. Jss1A was known all over the school as the most demonically wild and troublesome class in the whole school so what did you expect? Both the teacher and the students were shouting at the top of their voice. My sit was the first in the class (say a big thank you to my height) and I was the closest to the teacher. Out of love and pity for my ‘best teacher’ I raised my hand a little bit above my desk and when she came to me, I whispered to her “Please stop shouting ma” .. Yea I know what just crossed your mind… Was I crazy? Was I mad? ?… No! I was not! I still don’t know why I said it sef I wish I had left her to fall sick from headache. Well sha, she gave me a dirty slap o… umm it was funny! I knelt down ehn… for like 2 hours then she made me face the disciplinary committee which she was a member of then. They called me out during Angelus (one kind of prayer like that.. we said it by 12pm everyday) and gave me 6 strokes of the cain. It pained me oo don’t let me lie but still, shey I will be crying in front of the whole school ni?? Of course, “I dusted it”… lolzz.. it pained me but I didn’t move mehn .. . I didn’t !! . The other palava I entered in Jss1 was the day our home economics teacher who unfortunately for me was also a member of the prejudiced committee came into class and my really stupid partner started annoying me so, I hissed at him. She then said who hissed?? Me, Mumu boy I raised my hand. Kai! I won’t forget ooo.. I still wish I didn’t raise that hand oo… Maybe she had a quarrel with her husband that day, I really don’t know but before I could explain myself, I had received a couple of slaps and found myself in front of that bias committee again. The whole angelus scenario repeated itself but this time, I received 3 strokes. I WAS ALREADY POPULAR. Other things happened in my Jss2 and 3 that brought me out in front of that school but another really dumb one was the one that happened in ss1. That was legally the dumbest case I entered in Oscco and in short, till last year, I made up my mind to buy that school when I grow up and turn it either into a refuse dump, a piggery or a garage, but I changed my mind because if I like it or not, my alma matter will always be my alma matter… if not ehn!!!…. ok.. Let’s just leave it like that.. . So I was a member of one group like that in school. The group is a very good one I must say. If not for that group, I wouldn’t have smelt half of the places I have been to in Nigeria. so, I was a part of the state executives of the group and I was supposed to follow the coordinator for the exco meeting. This man left without even telling me oh and I was in school already. It was a Saturday! Lolzzz… this man left me without a word, I felt the day was still young so, I decided to take a day for myself. I did hang out with some friends, went to the café, etc, I shaa wasted it shaa then when I was about to go home, it started raining heavily so I had to wait for the rain to subside. When it did, I took a bike home. Unfortunately for me, my dad had already called the coordinator and the man said I was not with them. When I got home, I explained what happed to my dad and he said ok. Oooohh… I thought it was over. The next day that man first called me out of the line on the assembly and asked what happened and I explained to him. This man gave me a hot slap and said we haven’t settled it. Before I knew it, I was standing in front of those dementors again and then not only did the Angelus scenario repeat itself, I received another level of punishment. My name was already a “household” name in that school. My final year was very funny. I will give you the gist in the final part of Memories of High School. That one was the dumbest case any school could ever handle. This time, it wasn’t only me. It was all ss3 students in the hostel but I played a major role though. My next post will be “Memories of High School: KABIRU KABIRU!! BROTHER KABIRU!”. Well, I am not and was not a bad boy. All those jagajaga juniors that were saying things like “I want to be like senior Ose, quiet and bad” ..Ha!! me I am not a bad boy oo!! If they catch you ehn, it is between you, those dementors and your daddy oo!! Lolzz.. So, that was how I scaled through secondary school. You are free to post your comments and also subscribe for my newsletter just by the side of this post or under (I really don’t know) but try to do one or even both sef.. lolzz.. Keep away from trouble! .. Checkout the final part of the series “Memories of High School: KABIRU KABIRU!! BROTHER KABIRU!” on Thursday. Till then, PEACE! Nice bro. Also experienced some of those. Lolzzz… ur school father ;)… u can do that epitome of misery a great favour by telling him I AM FINE! Today na Thursday me don dey wait oo! Nice write up, but Joel you seem to forget all those funny experience in ss2.